Pop in to the High Weald Dairy and you are likely to bump in to me or my husband Mark as it’s very much a hands-on family business. Mark might well be in the dairy making cheese while I’ll be in the office making sure that everything runs smoothly. Here’s a little bit more about us and our business. In the late 1980s Mark and his parents Guy and Audrey, established a flock of 150 British Friesland sheep for milking at their small family farm in Duddleswell. The idea was to sell the milk to a local cheesemaker but, with each sheep producing up to three litres of rich milk every day, they were soon faced with a surplus. As a result, they began to bottle the fresh sheep milk and sell it to local health food shops where it was in high demand as a delicious and nutritious alternative for people with an intolerance to cow milk (find out more on our Nutritional Benefit page). Sheep milk yogurt followed next, and then a selection of cheeses, including 100% sheep milk Halloumi – originally supplied to the North London Cypriot community, Medita – a version of Greek feta cheese, then the hard, mature Duddleswell and Sussex Slipcote soft cheeses. As the cheese sales grew, so did the number of sheep in the flock, although there was a limit to how many could be kept on the small family farm. Soon other small dairy sheep farms began supplying them with sheep milk, so that they could sell cheese to retailers throughout the year. The range of organic cow milk cheeses developed gradually, initially as hard cheeses, but more recently as semi soft continental style cheeses. By 2003, the business outgrew the facility at Duddleswell and production was moved to Tremains Farm, in Horsted Keynes, a 350-acre family farm where 250 organic dairy cows were milked on site. A former grain store on the farm was transformed in to a modern dairy where Mark, and the cheesemakers who work alongside him, have been able to widen the range of cheeses produced. It’s fair to say that cheese is a bit of an obsession for Mark and, since I joined the business, his enthusiasm has rubbed off on me. He tells me I’m a lucky lady to have one of the cheeses named after me (Sister Sarah)! You’ll find us both at the dairy on a daily basis and, when we’re not making cheese, we’re often out selling it at one of the local markets, teaching others about it in the one-day course I designed to share our passion or enjoying a supper made with a recipe that uses it. Even when we go on holiday I’ll often find Mark has chosen a destination that just happens to be close to an interesting cheese producer. One of our other great passions is walking our dogs in the beautiful Sussex countryside in which we live and work – and did I mention that one of them is named Pickle? 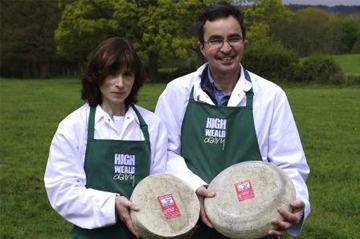 We are supported in the business by a small but passionate team at the High Weald Dairy and currently make 15 different cheeses with the entire process for each one taking place on the farm – and you can never be sure when another one will emerge as Mark loves to try out new ideas. With British consumers becoming more concerned with traceability, sustainability and supporting homegrown businesses, the High Weald Dairy continues to go from strength to strength. You can buy our cheeses direct from the farm, from farm shops and farmers’ markets in Sussex and from some larger shops and suppliers in Sussex and further afield. We also offer tiered cheeses for use as an alternative wedding or celebration cake and use our distribution network to support other Sussex producers.